Welcome aboard our beautifully appointed Duffy Electric Boat. Gold Coast Broadwater is your playground, what better way to explore it than on our stylish Duffy Boats. With our skipper onboard, you can sit back and relax while taking in the views on our calm water River/Canal Cruise with your family/friends. Our vessels are unique to Australia and are the Gold Coast most convenient and affordable Broadwater Adventure! 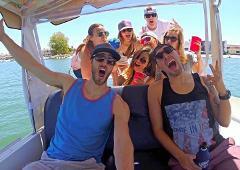 Our custom built boats are safe and are particularly good for those people who have NEVER been on a boat before. When you glide across the water in a Duffy Electric Boat, you'll be treated to a totally different boating experience, silky smooth and whisper quiet, your senses will thank you! Bring your picnic, gather your friends/family and hop onboard and you will be on your way silently cruising along the Broadwater for an enjoyable time on the water, while basking in our spectacular coastline. Duffy Boats are equipped with covered open-air canopy top, full window enclosures, (which is ideal for all-round viewing), lounge type seating, table with drink holders, an ice chest, iPod hook-up, Radio and CD Player so you can bring your own music. Plenty of photo opportunities, while taking in the magnificent sites of the Gold Coast skyline, waterways and the homes of the rich and famous. Kids will be delighted with the marine life, such as sea eagles, fish, pelicans, and on occasion, dolphins. We pride ourselves in providing quality service to our customers who have entrusted with us the task of creating a wonderful holiday experience for them and their families. We believe that our electric boats would be a wonderful experience for your stay on the Gold Coast, as it is like having your "Own Limousine on the Water"! Gold Coast tour highlights: as you will travel through Main Beach, Southport, Budds Beach, Paradise Waters, Surfers Paradise, Macintosh, Chevron and Cronin Island’s, beautiful homes, boats, restaurants, helicopters, secluded canals, unique flora and fauna, the beautiful natural environment of the Gold Coast and slide silently under bridges like they are in Venice, along with seeing marine life. Welcome aboard our beautifully appointed Duffy Electric Boat. Gold Coast Broadwater is your playground, what better way to explore it than on our stylish Duffy Boats, with our skipper onboard, you can sit back and relax while taking in the views on our calm water River/Canal Cruise with your family/friends. Our vessels are unique to Australia and are the Gold Coast most convenient and affordable Broadwater Adventure! Welcome aboard our beautifully appointed Duffy Electric Boat. 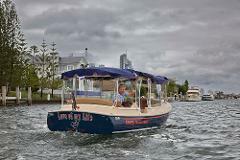 Gold Coast Broadwater is your playground, what better way to explore it than on our stylish Duffy Boats. With our skipper onboard, you can sit back and relax while taking in the views on our calm water River/Canal Cruise with your family/friends. Our vessels are unique to Australia and are the Gold Coast most convenient and affordable Broadwater Adventure! Our custom built boats are safe and are particularly good for those people who have NEVER been on a boat before. When you glide across the water in a Duffy Electric Boat, you'llbe treated to a totally different boating experience, silky smooth and whisper quiet, your senses will thank you! Bring your picnic, gather your friends/family and hop onboard, and you will be on your way silently cruising along the Broadwater for an enjoyable time on the water, while basking in our spectacular coastline. Radio and CD Player so you can bring your own music. Gold Coast, as it is like having your "Own Limousine on the Water"!